The Devil Made me do it! By it, I mean Cook A Mean Stew! I am feeling very relaxed this evening; I have an Italian stew simmering in the crockpot, a glass of wine next to me, and Lucifer playing on the television. This show is absolutely incredible, and the main character is not too hard on the eyes. I mean, with the accent and the face, he could make me a believer any day! Anywho, back to the food. 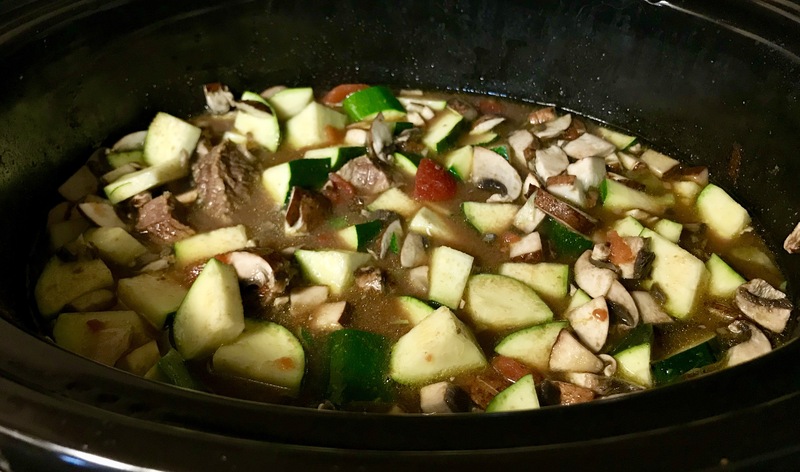 I found this Italian stew recipe on Pinterest that includes zucchini in place of potatoes. Don’t get me wrong, I am a HUGE fan of potatoes! With the holidays coming up, I will sacrifice now, because I will TEAR. UP. a bowl of potatoes on November 23rd! Until then, I think that it’s best to keep the added starch to a minimum. This stew is so simple that it practically cooks itself, all I had to do was put cubed chuck roast into the slow cooker with some low sodium chicken broth, diced tomatoes, a splash of balsamic vinegar, garlic powder, onion powder, salt, turmeric, and pepper. I waited one hour to add green peppers and two and a half hours before I added zucchini and mushrooms. I prefer mine a little squishy (if you didn’t know, that’s a technical cooking term), but if you prefer yours a little crisper, I recommend sauteing the veggies for a few minutes before adding them to the stew. The stew smells so good that I am salivating, and I cannot wait to eat! Even so, I have plenty to keep me occupied; I have my Lucifer and my wine. If you had the opportunity to make this stew, how did it turn out? Previous Previous post: I Couldn’t Come up with a Clever Title, but the Egg Suoffle is Delicious!